My husband and I have been married for over 15 years. We were married at a young age and spent the first 12 years of our life together working hard to realize our dreams. We were finishing college, buying a home, working towards career goals, and starting a family. Our kids were too young to understand a lot of the challenges we faced at the time. Now that they are older, most of the big life goals we set for ourselves have been reached and we have shifted our focus towards helping our kids learn to work for their own dreams. If we didn't share our experiences with our kids, they might assume that all of the things we enjoy now came easily for us. They wouldn't know about the mornings that started at 4am, student teaching all day, then heading to work in the evening, followed by a drive back to campus for night classes so that I could graduate early, all while pregnant! But we want them to know that we worked hard to reach our goals, so we do share our stories with them. In addition to sharing our own stories, we like to share the stories of other peoples with them as well. Stories of people who didn't give up. For my older children these examples take the shape of stories about real people like Helen Keller and Albert Einstein. For my younger kids, we use books like The Little Engine That Could and movies like Monsters University to teach the same message. We originally went to see Monsters University because we knew it would be funny, but we will watch the movie over and over again because it is a great story about the importance of believing in yourself. You might have to take a path that you didn't plan, but that doesn't mean you should give up on your dreams. Life isn't always going to be fair, but you can still reach your goals. Mike studied and worked hard, but he was still kicked out of the MU School of Scaring, but he found another way to make his dream a reality. He persevered! Do you have a favorite story you like to share with your kids about perseverance? Leave a comment with an example of how you believe in yourself and achieve your dreams and you will be entered to win a $50 Visa Gift Card and a Monsters University Blu-ray Combo Pack. 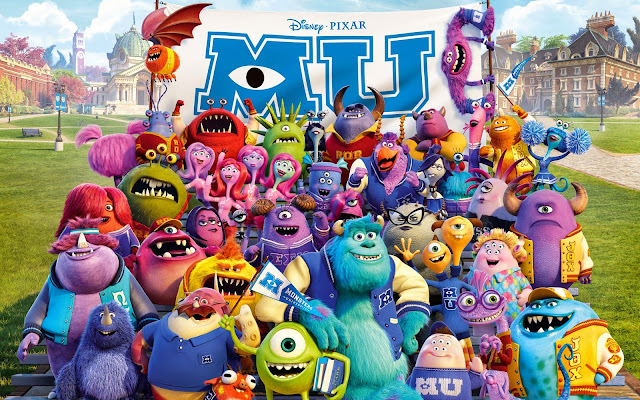 Monsters University will be available on Digital HD 10/8 & Blu-ray™ Combo Pack 10/29. Amen! Love this movie a lot! In fact my whole family and I are dressing up as MU students for Halloween!!!! Actually, it's the opposite here, my son is teaching us something about perseverance. :) He has set a goal for himself for the summer after his 8th grade year. He just started 5th grade. I followed my dreams, graduated college, and established myself in a career more successful than I thought I would be at this point. Currently working on setting new goals! I am achieving my goals and dreams by being the best teacher I can be and hopefully inspiring my students and own children to always follow their dreams and dream big! As a 6 yr old, my eldest child was diagnosed with a very rare blood disease that took him out of school for 7 years and limited his physical activities. Long story very short we helped him discover that he wasn't the only kid with something to over come, and that there is always someone who has it better and someone who has it worse. We taught him strategies to help him get through years of painful diagnostics and grueling treatments. Now as an adult he is living his dream of being a hero every day and he also finds time to volunteer within his own career and also for the Juvenal RA Assn. and has received honours for his work the past 3 years. He takes the lead now with adults and children, proving that disability, disease, and challenges can be overcome, if not recovered from, that you can always reach your goals, and being positive is key to that process. Thanks for spreading the word about finding a way to succeed, no matter your circumstance, no matter your goal. We always planned to go to college. My parents said they could not finance college for us so I had to self - finance. I don't know how I did it, but I did. I knew I wanted to get a degree and to go out into the world to do what I loved - the thing was that I would need a degree. How did I do it? I worked two jobs for three summers, I applied for nearly every grant, scholarship and a couple of loans. I did only work study during the school year. One year I got a paid position that paid half my tuition. It wasn't easy, but I graduated from a private college and eventually paid off all those student loans. We're getting ready to build our "dream" house. It's taken a lot of scrimping and saving to get here, I hope to teach my kids the value of money and hard work so they can do what they want with their money in the future. I just keep my goal in mind and don't give up on it until I accomplish it. It takes a whole lot of work and commitment! I always start with the end in mind. Envisioning what I want to accomplish keeps me going when the path gets rough. As far as teaching my kids about perseverance, you cannot beat the tortoise and hair! Slow and steady ALWAYS wins the race! What a great concept! We're trying to teach our young-uns to not give up, whether they're learning how to tie their shoes or read books. I'm constantly working on achieving my dreams. The biggest dream I've achieved so far is being a mom. Haven't achieved my dreams yet, but I stay positive and don't let others influence me in a negative way. I achieved my dreams because I reminded myself "just keep swimming... just keep swimming". I put myself through university and became a teacher (with debt that I have thankfully since paid off). I believe in myself with the power of prayer and positive thinking! These things can help you achieve anything! My husband has had to reinvent himself twice from active duty military to civilian to reservist and back to civilian. With moves and job changes at every turn. We always talk to our children about how God may not have the same idea for us every year, and that we need to adapt to our surroundings and learn to be content wherever we are and with whatever we are given. I started my own business while raising my children and I believed in my self and achieve my dreams by having positive self talk, and reflecting on all of the things I have been able to accomplish in the past. My children have seen how I have overcome failures and they know that stumbling blocks are lessons to learn. They have already overcome problems and failures of their own and gone on to be successful. By working three different jobs to get thru college! I believe in myself and achieve my dreams by understanding that what I have to contribute is of value and by surrounding myself with positive thoughts and, better yet, positive, supportive friends. 25 years ago I didn't think I could sing, but I took singing lessons, joined two choirs and have been singing ever since.